2. A lot of the papers were future plans or proposals or theory. I believe the SF group is probably the largest user community in the world, by a margin of two or three to one. 3. Made new contacts of people in San Diego and Tuscon. Will help our western net grow. 4. Swedes are putting together a net at Linkoping Univ. They may be able to provide us with a high-speed modem design, as it is a current research project there. 5. 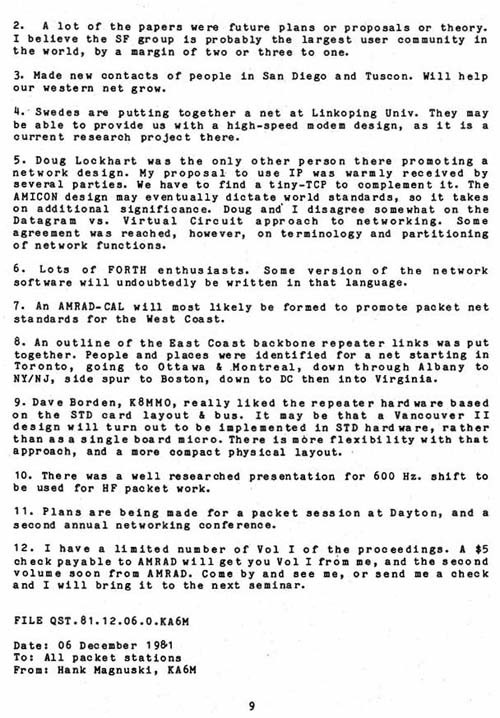 Doug Lockhart was the only other person there promoting a network design. My proposal to use IP was warmly received by several parties. We have to find a tiny-TCP to complement it. The AMICON design may eventually dictate world standards, so it takes on additional significance. Doug and I disagree somewhat on the Datagram vs. Virtual Circuit approach to networking. Some agreement was reached, however, on terminology and partitioning of network functions. 6. Lots of FORTH enthusiasts. Some version of the network software will undoubtedly be written in that language. 7. An AMRAD-CAL will most likely be formed to promote packet net standards for the West Coast. 8. An outline of the East Coast backbone repeater links was put together. People and places were identified for a net starting in Toronto, going to Ottawa & Montreal, down through Albany to NYINJ, side spur to Boston, down to DC then into Virginia. 9. Dave Borden, K8MMO, really liked the repeater hardware based on the STD card layout & bus. It may be that a Vancouver II design will turn out to be implemented in STD hardware, rather than as a single board micro. There is more flexibility with that approach, and a more compact physical layout. 10. There was a well researched presentation for 600 Hz. shift to be used for HF packet work. 11. Plans are being made for a packet session at Dayton, and a second annual networking conference. 12. 1 have a limited number of Vol I of the proceedings. A $5 check payable to AMRAD will get you Vol I from me, and the second volume soon from AMRAD. Come by and see me, or send me a check and I will bring it to the next seminar.